He is one footballer that can talk the talk and walk the walk. And yet, in this case it might just be all talk, unless we are not aware of some Ibra magic! With the exception of NFL running back Adrian Peterson, never in the history of sports injuries has any sportsman recovered from an ACL injury so quickly. But Manchester United striker Zlatan Ibrahimovic says he has recovered from his ACL injury and ready to play again. He is stepping up his recovery from the devastating knee trauma that supposedly ended his season. The 35-year-old picked up a serious knock against Anderlecht last month. Many feared and many hoped it had prematurely ended both his stay at United and perhaps even his career. Well the big Swede is saying we're wrong. He flew to the United States to undergo surgery, which was a complete success, and continued his early rehabilitation in Pittsburgh before returning to the UK on Tuesday. Amazing specimen. The surgeons who operated on him were astonished at the strength of his knees. They remarked that they had never seen knees like his, which were unusually strong. They were so impressed they said they would like to study him further in the future. 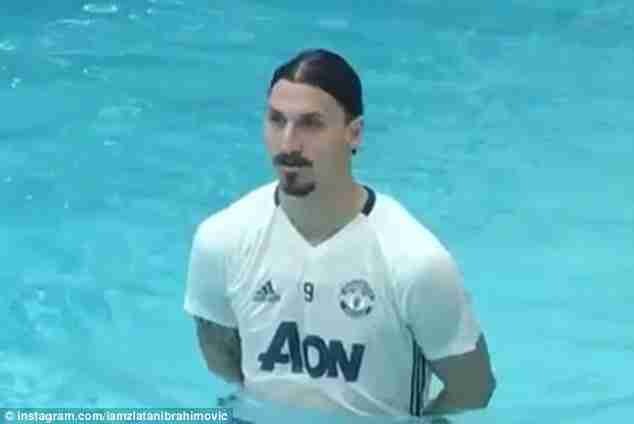 In typical fashion, Zlatan took to Instagram to post a video of himself seemingly doing resistance training in a swimming pool, alongside the caption, ‘Ready for the final’. Prolific striker Ibrahimovic had a sensational debut season for United, scoring 28 goals in all competitions before injury cut his brilliant season short. But many believe he was the missing link between Man United and the Premier league top four finish.